For Toyota, the recalls keep on coming. Toyota, after dealing with the faulty brake pedal issue affecting cars listed below and the Prius braking issue (today I actually heard a squeaky break on a Prius while walking down the sidewalk), announced last Friday that it is to recall Tacoma pickups with faulty drive shaft components. While the maker of these components also supplies Nissan and Ford, it seems only Toyota is having problems with them. According to Toyota’s website, they are “doubling their quality control efforts across the company.” While that may be the case, Toyota’s near impeccable record for quality has been shattered through this barrage of recalls. Surprisingly, Japan is acting defensively towards requests for the Toyota leader Akio Toyoda (Toyota) to testify before US congress concerning the string of safety problems and Foreign Minister Katsuya Okada warned that relations between Japan and the US may suffer. This also comes at a time when Japanese are protesting the US base on Southern Okinawa, and the Japanese government has put unfair rules giving tax incentives for buying ‘certified green’ cars, none of which are American. The bright side of this story is that Ford and GM are increasing market share, which should help the US economy as Ford and GM are both American companies despite Toyota hiring locally to decrease tariff rates on cars sold locally. While Japanese cars populate half of the street one will be hard pressed to spot even a single American-made car in the streets of Japan (this is from personal experience). GM, which has undergone bankruptcy and is effectively owned by you the taxpayer, will hopefully emerge a leaner, more technologically savvy player after the experience of management change and reducing its lineup. Investors who wish to bet on an American car company pretty much have one option: buy Ford (NYSE:F), its stock price has increased over 450% in the last year and 35% in the past 3 months. I would steer clear of buying Toyota stock (TO) as it has not been performing nearly as well as Ford. Toyota was founded in 1937 as a spin off from the founder’s father’s company Toyota Industries. Vehicles produced by Toyota Industries were exact copies of the American Dodge Power Wagon and Chevorlet models, and parts could even be interchanged. Toyota supplied vehicles for the Imperial Army during WWII, and was only spared because of Japan’s surrender a few days before a scheduled bombing of Toyota’s main factories. After the war Toyota committed to making civilian vehicles for Japanese, and in the 1970’s oil crises Toyota started to seriously compete with US automakers thanks to their fuel economy. In 1997, Toyota created the best-selling hybrid the world had ever known, the Prius. The following is a diagram from the New York Times displaying the discrepancy between U.S. Autoworkers and Japanese Autoworkers. The notion of Labor cost has been distorted to mean “hourly pay”. Yes, this is technically hourly pay going towards employment costs, but not to current employees. Check the chart, it is pretty self-explanatory. Should the Big Three be Bailed Out? The following question is just a part of the larger question. Should out-dated and underperforming companies be “bailed out” at the expense of tax payers? 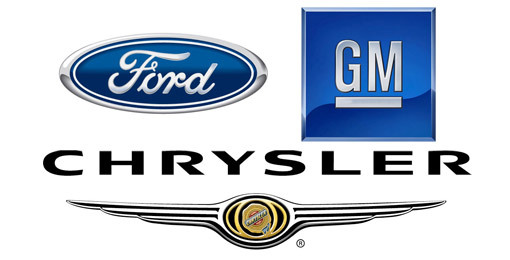 Earlier the banks were bailed out, and now the underperforming “big three (GM, Ford, and Chrysler)” car companies are set to be bailed out on Monday. First of all, it is clear that we all are stakeholders in this affair, and whether we like it or not it is ultimately not up to us to decide. Instead it seems the Treasury department gets to choose our destiny, be it for good or for ill. In my personal view, I think that extinct companies should not be kept alive with taxpayer money; The market has chosen who gets to live and die and certainly these mismanaged and union-enslaved companies deserve to die. On the contrary, in a real world perspective, the companies constitute a large portion of our national GDP and hundreds of large suppliers of parts would be devastated if these three went down.Not to mention the estimated total of 2.5 million jobs lost in connection to the downfall of the companies . Why and how did this happen? Well, it certainly didn’t happen overnight. Ever since the 1960s when cheap German cars were imported, and then the Japanese cars, and then the German and Japanese “invasion” to outwit a import quota by creating factories here in the middle of the US, the “big three” have been assaulted with better priced and better quality cars. It was only a matter of time before they were defeated, and today GM’s stock price is back to pre-1950 levels (it is now $3 ).